Meet Snoopy, our transport of the week! Snoopy’s mom arrived at Bubba’s Rescue in Waldron, Arkansas with 6 puppies. Snoopy and one of her sister’s were the only ones to survive. Snoopy is very lucky, and has been chosen to be adopted. This adoption is different than most because Snoopy will become a service dog for a four-year-old special needs boy. Tina, who is the President of Bubba’s Rescue in Waldron, Arkansas, personally knows the new family of Snoopy. This family has a son, who is four-years-old, and has recently lost his emotional support dog due to old age. 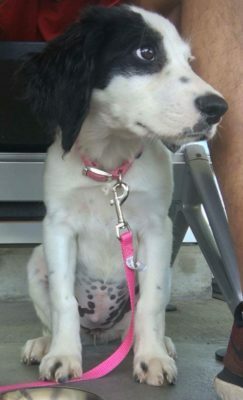 The family saw pictures of the rescues puppies and quickly picked out Snoopy. He picked out the name for his new puppy, Snoopy, or “Sloopy”, as he pronounces it. Bubba’s Rescue made sure Snoopy was healthy, spayed and was up to date on all of her vaccinations. The next step was figuring out how to transport her from Waldron, Arkansas . 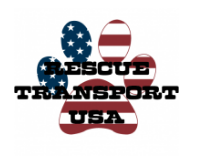 Bubba’s Rescue contacted Rescue Transport USA and asked if they would be able to help out. The answer was a definite yes! Snoopy’s new family had everything she could need including a kennel, food, puppy pads, collar and a leash, mailed to Bubba’s Rescue. With everything in hand, Snoopy made her way to her new friend, this past weekend. In the time before her transport, Tina would send pictures and videos to mom, that she would show. She would download the videos onto his tablet and he would watch Snoopy until the battery was completely gone. He couldn’t wait any longer, and with that, Snoopy was on her way. In a period of three days, traveling over 2,000 miles and with the help of seven dedicated drivers, Snoopy made it to her little boy. Thank you to everyone who helped get Snoopy here! Just in the two days she has been here David has shown marked improvement. He was having four or five “meltdowns” a day before she got here. Yesterday he had one and today, at 1pm, we have so far been “meltdown” free! That is great to hear Dawn! We are so glad Snoopy made it to you guys!